Nahum are an act from the Czech Republic, formed in 2004, and debuting one year later with the self-released demo Unhuman. Then things went silent, and it wasn’t until 2012 that the band returned with their debut full length (called The Gates Are Open), once again independently released in a rather limited edition. Then things turned into silence for another three years and a half, but now the band returns with the sophomore full length studio album, And The Chaos Has Begun, released under licence of Musick Attack. This new material was recorded in 2015 at the GM Studio and the Barn Studio with no one else but Martin Roženek (Adultery, Ador Dorath, Witch Hammer, Immer, Awrizis etc.) behind the mixing panel. The quintet (original members Tomash Nahum-g and Pavel Balcar-v, bass player Jan Balcar, and newly recruited Michael Kapec-g and Slovakian drummer Tom Brighter) created a concept about chaos and apocalypse, the final era of humanity that, indeed, has just begun. Their interpretation of it lasts for thirty three minutes, and gets interpreted the visual way via the artistic skills of Daniela ‘Dahlien’ Neumanova. And The Chaos Has Begun indeed is a creation of a soundtrack for apocalyptic earthly destruction, being a majestic, ultra-powerful and mega-hammering Thrash / Death assault. It’s melodic yet harsh, atmospheric yet merciless, epic yet destructive. I surely do detect quite some elements from the mid-nineties scene, and then I am referring to the American, German and, especially, Dutch scene, and that’s nothing but adorable. At least, if everything would be at least as interesting. So, is it? Well, actually, the song writing lacks of invention and creativity. But then again, I do not want to label this stuff as some cheap copy-cat alike nonsense; not because this band is renewing, for they are not at all, but it’s not ‘cheap’. And lacking an own identity, well, it’s not that ‘bad’ when the final quality is all right, or even more than average. And damn yes, the result is quite impressive, seen from sonic side. Every piece, or at least most of them, has that something epic, warlike and performanting to exceed the grey masses, and even though And The Chaos Has Begun has no real highlights, there are for sure no mistakes or disappointments either. Once again I’d like to end up with a final word about the sound quality. 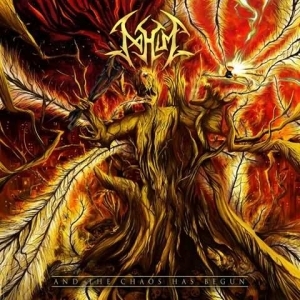 Well, you see, if you take God Dethroned, Unleashed, Sinister or – ah, skip the unnecessary bullsh*t; the sound quality of Nahum’s And The Chaos Has Begun is truly impressive. Their performance and song writing is great, but I think the production and mix are just fabulous: lacking of over-exaggerated would-be stupidity at the one hand, and still denying inferior under-productive nonsense too. This sound surely strengthens the (just more than average) songs, and that isn’t but a positive quality. Especially within the most thrashing excerpts (and from time to time early, very early Metallica and Slayer might come to mind, dear reader!!! ), the production comes to its peak!